Dreaming big: In the future, Dr. Scholtens would like to expand refugeehealth.ca to benefit refugees across Canada. 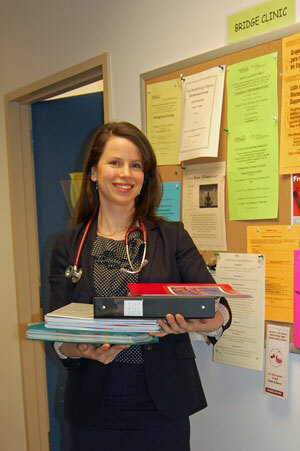 Dr. Martina Scholtens is a proud mother of four children, and refugeehealth.ca is her brainchild. While on maternity leave last year, the expert in refugee care built this one-of-a-kind website to open more health care doors for this unique population. The Bridge Clinic sees approximately 1,600 new patients annually, sometimes within days of arrival to Canada. It’s designed to provide primary care services while refugees settle in to their new lives; after a year, the goal is to transition patients to a family physician in the community. And that’s the challenge. “Many GPs don’t accept refugee patients because they’re unfamiliar with their specific needs or they’re unsure how to get paid for treating them,” Martina explains. What make Martina’s work so interesting ­– patients from far-flung countries, speaking a myriad of languages and presenting unusual conditions ­– are what make it so difficult for refugees to find a family doctor. How, Martina wondered, could we give GPs the information and confidence to serve this population? The answer, of course, is refugeehealth.ca. The site contains practical and popular patient handouts translated into multiple languages, and so much more. Saving trees and time: refugeehealth.ca replaces Bridge Clinic files and binders, eliminating wasted time and frustration trying to find resources to serve patients. “If I had a Bhutanese family who’d been refugees in Nepal since the 1980s,” says Martina, “I could look up their cultural profile on the site to understand the political and medical issues. Dr. Patricia Gabriel of Port Coquitlam’s Medical West family practice uses the website regularly. 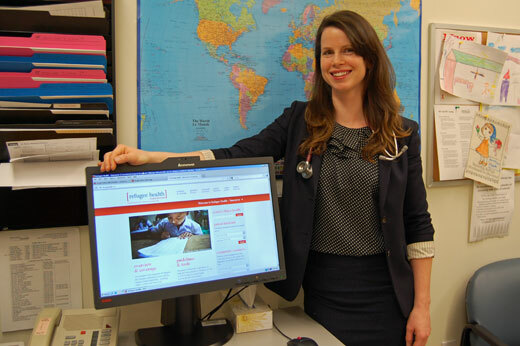 As a UBC primary care researcher, she also conducts research in refugee health. Martina developed the site with the aid of a grant from the B.C. College of Physicians, the services of a professional web developer and the support of student and Resident volunteers. Maintaining the B.C.-oriented site is an ongoing job for which she’s grateful to have the help of her Bridge Clinic colleagues and friends. More than 3,700 visitors have referred to the site so far, and as many as 500 of these visitors are regular users. “As physicians learn about the site, we expect to gain visitors and, over time, more GPs will accept refugees as patients,” she says.